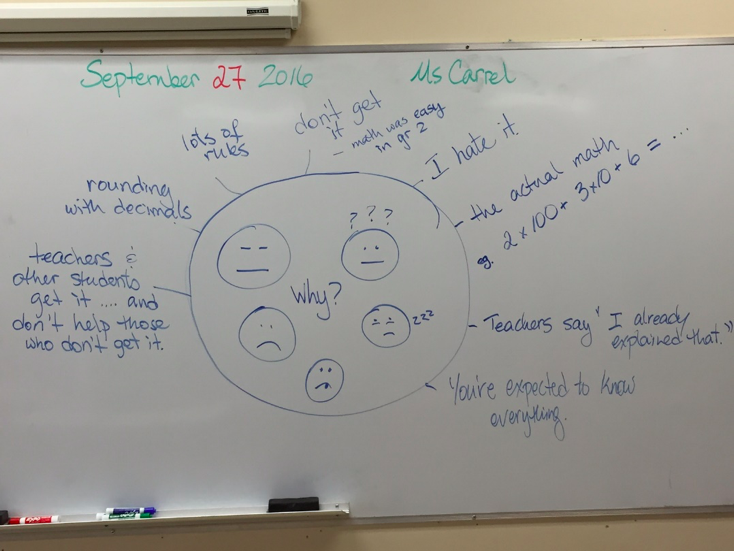 » What Do You Do When Your Students Hate Math? What Do You Do When Your Students Hate Math? Every year I have students who hate math or feel as though they can’t do math. Sadly, this isn’t just a couple of kids but rather a larger group who have been broken down over the years and by the time they get into middle school they see themselves as bad at math or worse yet, incapable of understanding it at all. We know that emotions play an enormously important role in learning; when people feel stressed, upset, and anxious they don’t have the ability to learn well. This is physiological! People learn best when they feel calm, happy and safe. When students hate math with such passion, how open do you think their brains are for new learning? Not very….and the result – they just fall further and further behind and their hatred deepens. Last year I saw one of these struggling learners transform in the last few months of grade 8. It is these transformations that really inspire me to keep doing what I’m doing. This boy from last year, I’ll call him Joe, was a struggling math student since I met him in grade 6. He is a great kid and did the usual behaviours to avoid his math struggles; pretending to be paying attention, leaving to go to the bathroom, getting water, going to his locker….any excuse to leave class. We all know these kids – they slip through the cracks and often they work really hard and really want to be successful (don’t we all?). I bet you have already identified some of these students in your own classes. So….what do we do about it? How and why did Joe transform? Because I know that I need to address these toxic feelings towards math (and often towards themselves as learners) one of the first things I do in my math classes is to ask students to fill out a math biography. This gives me a lot of information about their current attitudes and beliefs about themselves as learners. I like to ask them to rate their confidence, ability and affinity to math at the end of the year as well so I can compare them to the beginning numbers (found on the math biography). I also notice that those who scored themselves very low are most often the struggling learners. I also notice that many of these students are actually very capable but have just never been taught math in a way that helps them to understand it. I urge you to try this – you could even assign it for homework so as to not use class time but if we, as educators, ignore these negative feelings they will literally get in the way of learning opportunities. Anya Carrel is a teacher in Terrace and works with struggling math students in an intervention role. She did something that is similar to the math biography but so much simpler and perhaps more telling. 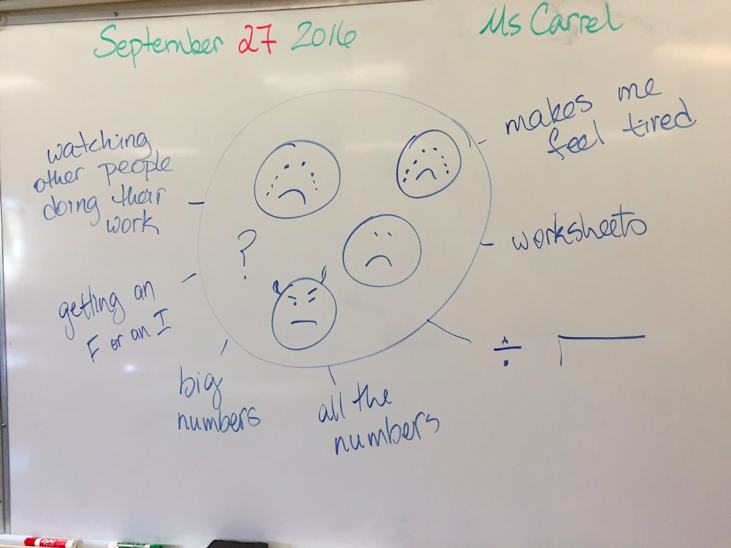 She asked them to draw an emoji of how they feel about math. Below you will see the pictures. She then asked them to list the reasons why they feel the way they do. I LOVE this – it gives so much information and allows the students to be honest about their feelings and is a great place to then start changing their attitudes and beliefs about math. When I saw these images it hurt my heart – and also inspired me to continue urging and supporting teachers in changing how we teach math so that we can avoid these in the future. Anya shared that two other emojis were drawn by students- the steaming poop and the middle finger – she asked them to use a face emoji instead, to be school appropriate but, boy, don’t those images send a strong message?! I would love for others to try this out and please share in the comments what came out of the exercise – either using the biographies or the emojis. Math is not for the special ‘math people’ – every student is capable of success in math if we work towards teaching math in many ways to meet their many needs. Back to Joe, what changed? I’m not entirely sure because we used so many different strategies: using manipulatives, teaching math conceptually instead of focusing on procedures, teaching about growth mindset and using structured partner talk. The real turn around happened when we started using collaborative teams. I was worried about him as I feared the concepts and pace of the group would be too much for him but to my very pleasant surprise, he improved so dramatically it blew me away. I think it was that the teams gave him the one-on-one help throughout the whole class he needed AND they made it so that he couldn’t escape the math as he had been doing for years. Once he believed he was actually capable it was like a door opened and he could just learn. It was so amazing to see his confidence soar alongside his achievement. Mathphobia and math anxiety is alive and well not just in our students but in adults too (many of your students’ parents and even, dare I say it, teachers are math-phobic). I have a close friend who has been wanting to retrain from being a hairstylist to either a teacher or a nurse. She has avoided going to college for 10 years for ONE reason: math. What a loss of opportunity for her and she is not alone, this, sadly, is way too common in our society today. Let’s change this so that all students have MANY opportunities for their futures! If you are interested in learning more about ways that engage students in math and help them to develop their confidence and improve their achievement check out our resources here! Doing mathematical solution manually , whatever it is, is good thing because the knowledge will be kept refreshing but sometimes when you are doubtful with your answer, it will be good if you can have some reference or guidance to make sure your solution is correct. So calculator would be handy in this case. Plus, if you are on doing it on a very short time, calculator would really help you save time. Next PostNext Seeing is Believing!